So, it's Hanukkah, or, I guess it was Hanukkah. I don't much keep up with these days. It's a holiday that isn't especially holy or important to the Jewish faith. It's a celebration of a miracle, and like a lot of religions, it's a holiday that breaks up the dark, miserable, monotonous Winter nights with light! And fried food! And presents! And decor far less easy to manage than a tree that sheds needles all over hell. My paternal grandfather was Jewish, but he still loved Christmas. He worked in retail, so, there's that. But he enjoyed the festivities. His kids (Dad and Aunt Mary) were raised Presbyterian (reluctantly, I'm told), because my maternal grandmother grew up Baptist (I think), and this was sort of splitting the difference. I also wonder if he perhaps thought it would be easier for the kids to be Christian. As it happens, they ended up both being fairly secular. But my Grandfather loved Christmas. 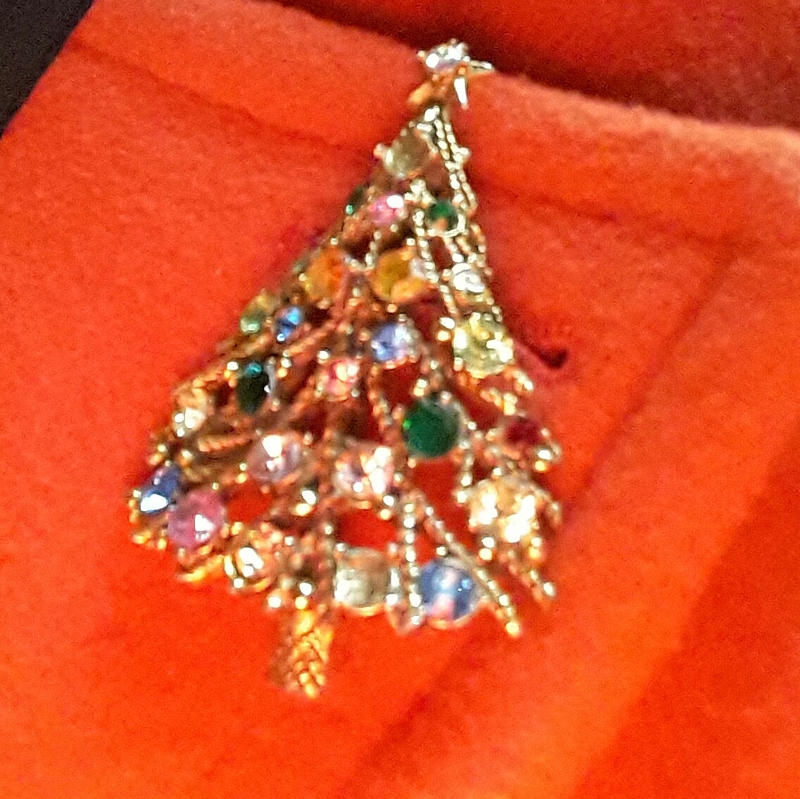 He gave my mother this brooch, but she doesn't wear gold near her face these days because her hair is silver. So, score! It is missing a few rhinestones, so I need to have that taken care of. Eventually. It's just costume jewelry, but I can't find anything for Christmas that I love as much. Anyway, it's nearly Christmas here. But more pressing, tomorrow is the Winter Solstice, meaning that from tomorrow forward, we'll get progressively more and more daylight. When I lived in Atlanta, that was far less of a big deal. Winter on the Eastern edge of Central Time is brutal. It gets dark early and stays dark forever. The Christmas lights offer some respite, but it's still not easy. I am totally and completely done with Christmas shopping, now I just have to wrap it all up and deliver it to the recipients. Tomorrow, one of our Business Development guys is taking my team to lunch - it's completely unnecessary, but a nice gesture. I enjoy his company, and my team's company - so it should be good. I'm meeting my friend Jim for dinner. Also good. Work has been killer - just tons of writing, writing, proofreading, comparing, compiling- all things I do reasonably well, but you can't just do it on autopilot. My brain usually feels worn out at the end of the day. But I love it. This year has been crazy, but fantastic. I need some rest, and I'll try for that over the holidays, but I'm tired. I got new tires yesterday. Not cheap, but worth it. You don't want to be caught in the winter weather with shoddy tires. I've been hemorrhaging money the past few weeks, but come January 1, it's belt-tightening time. Both physically and fiscally. I think that's about it. I am going to spend some time with the house K9. She gets antsy at night, she needs her buddy to come over.